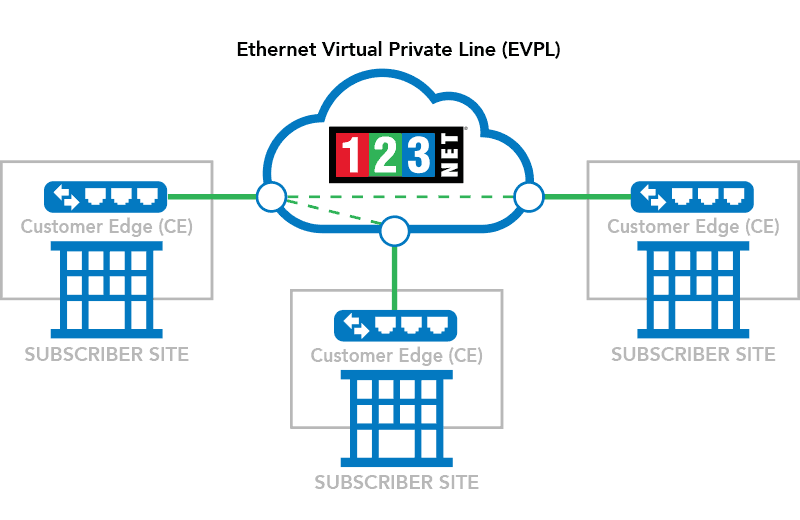 Business data is transported across Point-to-Point Ethernet Virtual Connections (EVCs) according to the attributes and definitions of the E-Line types defined in the Metro Ethernet Forum (MEF) specifications. The EVC carries data in the form of Ethernet Service Frames from User Network Interface (UNI) to UNI as shown in the diagrams. EVCs can contain bandwidth profile parameters containing attributes like Committed Information Rate (CIR), Excess Information Rate (EIR), Committed Burst Size (CBS), Excess Burst Size (EBS), Color Mode (CM) and multiple Class of Service (CoS). 123Net’s Ethernet solutions provide a secure, reliable, low latency environment that helps commercial companies manage data growth and securely access their network resources. EPL is a high-capacity, cost-effective solution for businesses requiring direct connections. Data travels securely within a Layer 2 dedicated point-to-point connection. This is an ideal replacement service for traditional TDM point to point service. EVPL is a high-capacity multi-point solution. Data travels securely within a Layer 2 dedicated connection. This is an ideal replacement service for traditional TDM private lines, ATM Layer 2 VPNs, Frame Relay and IP VPNs.